A podcast I really enjoy is called Song Exploder. In it, musicians pick apart the recordings of songs to explain how they were created, and you get to hear how the song was developed, track by track. For the anniversary of the Space Shuttle Columbia disaster (February 1, 2003), I present you my favorite episode: The Commander Thinks Aloud, by The Long Winters. I first listened to this on a terribly rainy drive to teach a model rocketry class last summer, and I've listened to it several times since. It's very moving. Part 2 of our conversation with Charles Savoie of Aerotech is now on The Rocketry Show. Also, CG, Gheem and I discuss an exciting rocketry project I witnessed a couple weeks ago - a finless, gimbal-stabilized rocket, which attempts to land under motor thrust, just like the SpaceX and Blue Origin rockets. We'll talk more about that project soon! If you build your rockets well and prepare them carefully for launch, most of your flights will go well. Sometimes, however, you will have flights which do not go as planned. Any number of things can happen - the recovery system (streamer, parachute, etc.) may fail to deploy. Fins may break off in flight (this is known as a shred). A rocket which normally flies perfectly may fly in an odd trajectory. 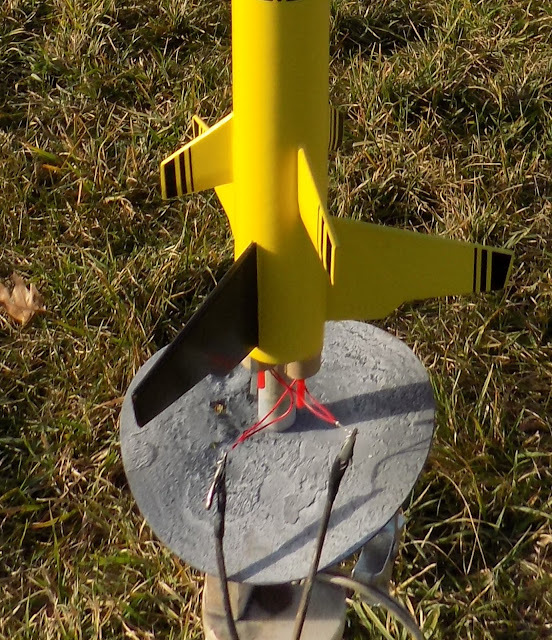 Bad flights may result in light to heavy damage of the rocket, up to and including the destruction of the model. Then, sometimes you get lucky, and there's no damage at all. My Quest Magnum Sport loader - one of my favorites - after a recent bad flight. A beginning rocketeer may just figure that this is "one of those things," shrug his shoulders, and maybe trash a damaged rocket. But doing that will not help you to take steps to reduce the chances of a wonky flight in the future. What you want to try to do is figure out what went wrong - a little post-flight analysis - and when it went wrong. Damage may happen to a rocket at any time in flight - during liftoff, during powered flight, at apogee, or at recovery. I've been building and launching rockets for about a year and a half now. I've learned a lot, and I've read a lot, and I feel pretty knowledgeable compared to where I was when I started. But I still consider myself a rocket n00b. Because I don't get to launch as often as I'd like, I don't have a ton of experience either having perfect flights or failed ones. When I first started launching rockets with my friend Chad, I had a lot of success. He didn't. All my rockets flew well, and returned undamaged to the field. Chad lost them left and right, and suffered a lot of damage to the rockets he didn't lose. Chad's Estes Crossfire ISX landed on some thin ice and lost a fin. And when the ice melted, the rocket was gone. my chutes all opened, they landed softly, and blew across to the other side, where they were recovered. But recently, I've had bad luck on the launch field. I decided to break things down and figure out what happened in these flights, because I want to improve my chances of having nominal flights. Because of my lack of experience, I can't give you a comprehensive list of what may go wrong in flight, but if you examine the evidence, you'll learn to figure these things out for yourself. Doing a post-flight analysis is a bit of detective work. It is like, in miniature, what aerospace professionals do after an unsuccessful flight, except that it involves much smaller rockets, simpler systems, and less money. But like Space X or NASA, examining the evidence after a failed flight will help you prevent the same failure in future. What you want to try to figure out is what happened, and why it happened, so that you can take steps to prevent its happening again. Sometimes analyzing what went wrong in flight is simple - you look at the rocket on the ground, and you can see what happened, and why. At other times, you may need to examine different pieces of evidence to complete the puzzle. Incidentally, it's a good time to mention a basic piece of rocket launch etiquette. Generally, when launching with a group or a club, it is best to let each rocketeer recover his or her own rocket, rather than doing it for them. A rocketeer may ask someone else to recover the rocket for him or her. Sometimes you may find a lost rocket. For small model rockets, it's sometimes OK to pick it up and return it to the launch site - some clubs have a Lost and Found table. Some clubs may prefer that you simply note the location of the rocket and let the Launch Control Officer know, so that he or she can make an announcement. I can't give you a hard and fast rule here: when in doubt, just inform someone of the location (and either model or color) of the found rocket, and leave it be. But never move a high power rocket if it's not yours. High power rockets often use a recovery system called dual deployment, which involves installing black powder charges inside the body of the rocket and using electronic altimeters to eject the recovery system. Many high power rockets have redundant, or back-up, altimeters and charges, and as a result there may be unfired black powder charges inside a high power rocket. Simply inform the Range Safety Officer or Launch Control Officer of the location of the rocket, and allow the person it belongs to to recover it. The following is an example of a post-flight analysis of some unsuccessful flights I've had recently, along with my best educated guesses as to what happened, and some ideas for how to prevent flights like these in the future. These are educated guesses - perhaps some more experienced rocketeers will chime in in the comment section. This blog is a learning experience for me, too! In this case, I was lucky. Not only did I get to see what happened on the field, I also had some other bits of evidence to examine later - photographs and video. I've had a lot of bad luck at launches since I started flying at the CMASS field in Amesbury. Lost rockets, broken shock cords, etc. So even though I took some of my larger models, determined to fly some rockets I'd been too nervous to launch previously, I decided to start simple, with my very first model rocket, the Estes Der Red Max. It's a reliable flyer, performs well, but doesn't go too high. I prepped everything very carefully the night before, and though I'd have have an easy flight. At the launch pad, because of the direction of the wind, I tilted the launch rod a bit, to make sure that the rocket flew away from the crowd, and away from the large, overgrown, kind of swampy field where rockets had landed before. This was simple to figure out. The club often uses clothespins as standoffs for launch rods. This is similar to what you may have done by simply wrapping the launch rod in masking tape - it keeps the rocket up off of the launch pad blast deflector. or just above a ring of masking tape. This holds nicely. It took me a minute to realize what the problem was. When I tried to pull the rocket off the launch pad, it got stuck - on the clothespin. The thumb grip tab on the motor hook got stuck on the standoff! The solution to this is simple: either adjust the standoff so that the hook is not positioned near it, or use a different kind of standoff. It pays to bring a couple of items along with you to a launch. Even if you launch with a club, it is acceptable to use some of your own accessories. I might bring my alligator clips with me next time. They're smaller and shorter, and have never gotten caught on a motor hook. One benefit of this launch failure was that it gave me the chance to see a nose cone ejection close up. It's interesting to see that it's not terribly powerful. The Red Max is a short rocket with a relatively small internal volume, but rather than popping off the rocket like a cork from a champagne bottle, the nose cone simply hops off. After... Look what my rocket did to the blast deflector! After this happened, the decision was made by the club to switch over to a different set of standoffs - expended motor cases slid down over the launch rods. We'll see a picture of that down below. After a few more false starts, I got the Red Max to launch and the flight was successful. Ready to launch, with an 808 keychain spy camera taped onto the side. Once I'd figured out the problem with the Red Max and had a successful flight, I figured it was time to bring out something more interesting. Since joining the club, I hadn't launched anything too pretty, large or expensive, because I was always too nervous about the wind - especially after some of my smaller, cheaper rockets vanished or had issues. The Amesbury field is pretty big for model rockets, but it's a bit breezy, and several times I lost my nerve about launching something I'd spent a lot of time building. Still, the winds weren't too bad on this last launch, and I was determined to put something in the sky which I hoped other people might have found impressive. I selected the Quest Magnum Sport Loader. Despite being one of my earlier builds, I really liked how the rocket turned out. And it's a cluster rocket, meaning that it uses more than one motor at a time, side by side. In this case, it's a two-motor cluster with a payload compartment large enough to house two eggs. Egg lofting is a traditional challenging payload for model rockets. The idea is to launch something with some weight, which is fragile, but which isn't alive, and get it back in one piece. If you break an egg, you have a mess on your hands, but you haven't killed a poor little animal. This was my first cluster rocket, and I'd launched it successfully last fall. This would be its second flight. I felt pretty confident I'd prepared it well, and that the weight of the egg inside would keep it from flying too high, so the odds of getting it back seemed pretty good. And I figured it was about time I got some cool point-of-view liftoff video, so I taped an 808 key chain spy camera to the side. Model rocketeers tape small cameras to their rockets all the time, and the 808 camera is a common camera of choice. I'd attempted this before, but the cheaper cameras tend to break for no reason at all, and my first one died on me as I was prepping it last summer. So I bought five more for little more than five dollars a piece (if I spent more on a camera, I'd have a more reliable camera, but I'd risk losing something more expensive in a tree). I was ready for a great flight with a challenging payload. I figured this would make up for my losses and lack of nerve at previous launches. Needless to say, the egg was smashed, and it even broke through the plastic zipper bag I'd placed it in to keep it from leaking in case it didn't survive. I had to run the whole payload over to the trash can and dump egg into it, wiping out as much of the goo as possible. It's possible that the electrical tape holding on the camera prevented worse damage. the mud and wiped it off. I may be able to polish this out. Why the odd flight? Was it, as the Launch Control Officer suggested, that an egg it a lot of mass, even for two C6-5 motors? Well, in this case, no. I'd launched the rocket before on two C6-5's, carrying an egg on board. And the kit is made to carry up to two eggs. The flight won't be terribly high, but it should still fly normally. So, what went wrong? Well, if you watched the video above, you know what the problem is: one of the two motors did not ignite. But why? Let's examine that. I really love cluster rockets, but they can be tricky. The big challenge of cluster rockets is getting all motors to ignite simultaneously. In order to do this, you must take certain steps, and consider a few things. When you launch a model rocket, obviously you need an igniter for the motor. It may also be obvious, but I'll state it anyway, just to be sure: when launching a cluster rocket, each motor needs its own igniter. 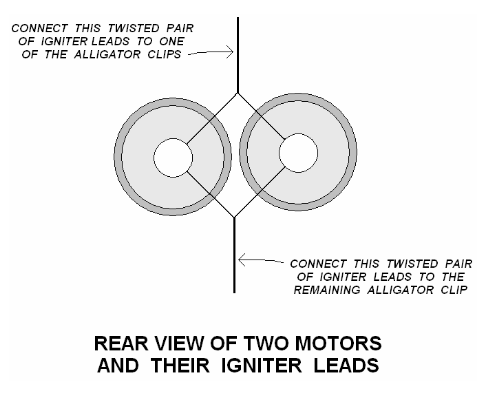 Two motors - two igniters. Four motors - four igniters. Etc. And each igniter must be hooked up in a circuit with the launch controller leads. But they must be wired in parallel. This is as opposed to being wired in series. Imagine a strand of lights hooked up to a battery. A series circuit has a wire which goes from the battery to one light, which then connects to the next light, which then connects to the next, etc., until finally a wire connects back to the battery. Now, if one light burns out, the circuit is broken, and all the lights will go out. Perhaps you are old enough to remember when this would happen to Christmas tree lights - one bad bulb, and the whole strand would go dark. You'd have to look at each, individual bulb to find the bad one and replace it. It was a real pain. This doesn't happen to Christmas tree lights these days, because now they are wired in parallel. In a parallel circuit, each light is connected directly to the power source. It may use only one set of wires, but both terminals of each light connect directly to the wires leading to and from the battery. If one bulb burns out, the others are still connected to a complete circuit, and they continue to glow. Back to model rocket igniters. Often, when an igniter fires, it burns through or breaks. Not always - some people have reported getting multiple uses from a single igniter. But often, the igniter looses its connection. Igniters in cluster rockets must be wired in parallel, because if one igniter fires a fraction of a second before the others, it may sever its circuit. If the igniters were wired in series, that would break the circuit to all of them, and the other motors would not fire. The rocket would leave the pad with some of its motors not firing, and you'd get the off-center thrust seen in my video above. Launch controller wires have two leads, one for each end of one igniter, so how do you wire multiple igniters to one launch controller? There area a few methods. One method you may have heard about, if you've already looked into cluster rockets, is called a clip whip. This is a set of wires with two leads on one end, and four or more leads on the other. The end with two leads connects to the launch controller leads. The other leads connect to the igniters. They are color-coded red and blue, so that you can make sure you get a complete circuit on each igniter, attaching one red lead and one blue lead to each. The clip whip splits the current from the launch controller and delivers it to each of the igniters in parallel. If you have a smaller number of motors and they're close enough together, a simpler method is to twist the igniter leads together. Take one lead from each igniter and twist them into a bundle, then take the other lead from each igniter and twist them into a second bundle. Now you have two leads. Sorry my hand is in the way here. But you can see that the igniter leads are twisted together in two bundles. This photo is of my three-motor cluster Trident 1A. Three motors - three igniters. Here's a simpler picture of two-motor cluster wiring, from True Modeler's Rocket Kits. Wiring model rocket igniters in parallel is very important for cluster rockets, but it's also important to consider what kind of igniter you use. This is actually a pair of igniters. To use one, you cut them apart and install only one in the motor. Current from the launch controller passes through the wire leads and up to the tip. It's hard to see in this picture, but at the very tip of the igniter is a much finer wire, called a bridge wire, which connects the two thicker wire leads. The bridge wire is made of nichrome, which has a high resistance. Because of its resistance, when a sufficient amount of electrical current passes through it, the nichrome gets hot and glows white. Because it is on contact with the propellant of the motor, the motor ignites. This is why it is important to correctly install the igniter. If the igniter tip does not touch the propellant in the motor, you get no ignition. These are the newer-style Estes igniters. As you can see, the tips are white. In fact, they're kind of old-fashioned. In the early days of model rocketry, a simple length of nichrome wire was all you had to work with. They do work, but they sometimes fail. I say they're kind of old fashioned, because until recently, Estes igniters had a bit of help igniting by a little bit of black or dark gray pyrogen on the tips. On the left, the new Estes "white-tip" igniters, with nichrome wire only, and no pyrogen. On the right, the discontinued "black-tip" igniters, with pyrogen coating on the nichrome wire. While the new, white-tipped igniters glow hot when the launch controller button is pressed, the older, black-tipped igniters fire with a tiny, audible pop! as the nichrome heats up the pyrogen. This tiny little flame helps ignite the motors, sometimes even if there's a tiny gap between the igniter and the propellant. And it helps the motor ignite more quickly. Unfortunately, Estes recently went back to the old-style, white tip, nichrome-only igniters with no pyrogen tip. They (usually) work fine for a single motor, but are simply not sufficient for cluster rockets. But even if you have some of the black-tipped Estes igniters, for clusters, there is a better option: the Quest Q2G2 igniter. For reliable cluster ignition, the Q2G2, manufactured by Quest Aerospace and seen above, is much more ideal. Why? Because they are low current igniters. A typical Estes igniter requires a minimum of 1.0-1.2 amperes of current to fire, while the Q2G2 requires only 0.55-0.6 amps - about half the current*. For a single rocket motor, you'll get more than enough current to fire the one igniter you need. But when you cluster motors, you are dividing the current up among all the igniters - so each igniter gets less current. That means they may fire more slowly. When I say "slowly," we are talking fractions of a second. But that counts when igniting clusters. If one igniter fails to come up to firing temperature before the others, you may have the rocket leave the launch pad with one or more motor not ignited. The force of the rocket flying off the pad will pull the launch controller clips off the bundle of igniter leads, and the one or more unlit motors will never get the chance to ignite. An igniter which requires less current to fire in the first place will be faster to ignite - even with the current split up among several igniters. You are more likely to get simultaneous ignition of all igniters when you use the lower-current Q2G2 igniter. That said... When I recently wrote about my cluster problems on the NAR Facebook page, someone said "That's why you never use Estes igniters in clusters. They don't work." Fair point, except for two things: 1) I used Q2G2 igniters at this launch, and 2) you can use the older style Estes igniters - sometimes - and have successful ignition, as long as, a) you don't have more than two or three motors, b) you have wired the igniters in parallel, and c) you have a powerful enough (12 volt) ignition system. They may be less reliable than the Quest igniters, but they will often work, as long as you satisfy these criteria. How do I know this? The video posted above with the successful launch of the Magnum Sport Loader used Estes black tip igniters. The Q2G2 igniters went off the market for a while, and presently they're hard to come by. They are still being manufactured, but the supply is having a hard time keeping up with the demand. Quest will soon be moving its manufacturing back to the United States, and I hope this makes the Q2G2 more readily available. But if you can't get hold of them, and you have some old Estes igniters (or can bolster the new white tip igniters with a pyrogen dip), and are not attempting a cluster of more than two or three motors, you still have a decent chance of success. *I am not an electrical engineer, but I've learned enough to get by - for now - in rocketry. The information above about minimum current required for Estes and Quest igniters, plus a lot more detailed information on launch controllers and igniters and how they work, can be found in the book Make: Rockets: Down-to-Earth Rocket Science, by Mike Westerfield. So, I had my Q2G2's installed, wired in parallel, in contact with the propellant, launching on a 12V system, yet I had an ignition failure. WHY?? First question: Did both igniters fire successfully? Yes, they did, as can be seen from the photo above. Let's take a look at the rocket from a different angle. This is the nozzle of the unfired motor. 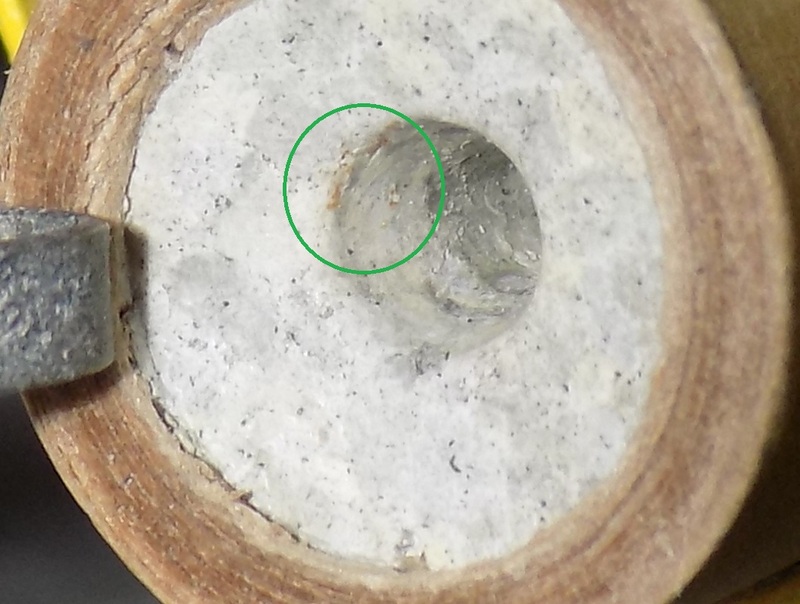 The clay nozzle is a whitish gray color, but do you see the slight brown? This is a burn mark. The igniter fired, and the pyrogen tip lit, but it did so in the end of the nozzle. The igniter got pulled nearly completely out of the motor before the Q2G2 igniter fired. It is possible that one motor fired, then lifted the rocket off the pad before the second one got lit. But with only two motors, using those fast Q2G2 igniters, and considering how slowly the rocket lifted off, this is probably not the problem. The problem occurred earlier. What happened, and how could I have prevented it? Thinking back to our unsuccessful launch attempt of the Der Red Max, I mentioned that after the rocket got caught up on the clothespin standoff, the club switched to expended motor casing standoffs. That was great for most rockets, but because this particular rocket has a wider payload section, the launch lug is on its own standoff (the word "standoff" is used for both items, though their function is different). This positions the launch lug so that the rocket can slide down over the launch rod without the rod hitting the payload section. launch rod standoff, such as the clothespin mentioned above. Using a motor casing as a launch rod standoff, I found that I couldn't get the rocket to sit on the casing, because the launch lug standoff was too tall. The rocket slid all the way down to the metal launch pad blast deflector. That meant that the launch controller clips were sitting right on the deflector. That would mean that the current from the launch controller would simply go through the deflector, and not even get to the tips of the igniter. I had to do something about this, so I gently bent the ends of the igniters to one side, hoping I could get the launch controller clips away from the blast deflector. In doing so, it is possible I pulled one of the igniters out of the motor. But I was very, very careful in doing so, and I had those igniters installed nice and tight. Eventually, I got the rocket to stand on the launch rod standoff. The bending-the-igniters trick wasn't working. I hooked up the launch controller clips to the igniter leads. You can see the motor casing standoff below the rocket. But look at how much tension is being put on the igniter leads. As you can see above, the heavy launch controller clips are putting a lot of strain on the igniters. With the launch pad swaying back and forth, the tension must have worked an igniter loose while the rocket was waiting its turn for launch. This igniter looks like it's under a lot of strain. It's the one that failed to ignite the motor. So, there you have it - the weight of the launch controller leads, plus the swaying of the launch pad, and fiddling with the igniter wires and launch pad standoff all worked one of the igniters loose. The solution: There are several things I would do differently if I had this launch to do over again. The first and most important would be to support the weight of the launch controller leads, so they don't put their full weight on the igniters and pull them loose. When I launch with my own equipment, I have an easy way of doing this. My launch pad is a camera tripod with the Odd'l Rockets Adeptor attached to it. This allows me to secure a launch rod 1/8 to 3/32 inch in diameter on the same pad. The Odd'l Rockets Adeptor on my launch pad. Note the binder clips I keep attached to the blast deflector. The blast deflector is a piece of hardware called an electric box cover. It has some slots cut into the corners - I suppose for screwing the cover to an electric box (whatever that is. I don't know what half this rocketry stuff is supposed to be used for. I just use it for rockets). Those slots are perfect for supporting the launch controller lead wires. I just lay one wire in each of two slots, and use a binder clip to secure it in place. I lay the launch controller leads in the slots in the blast deflector, then clamp binder clips to the deflector. Note, I am not clamping the wires down themselves - I just have the binder clips holding the wires in place. Now there's a lot less weight on the igniter. With the club blast deflectors, an effective way to support the launch controller leads would be to pull up a bit of slack on the leads, then clip them to the blast deflector with a clothespin. Safety note: You can see I've set this up inside for the photograph. But the launch controller leads here are not attached to a launch controller, so there's no chance the motor will ignite. Please don't launch your rockets in the house! I'd also have used a different launch rod standoff. For this rocket, a clothespin standoff would have been ideal. It's a good idea to bring a few things with you to a launch, and a few clothespins would have been a good thing for me to bring. The Quadrunner, by Quest Aerospace, is a big, beautiful four-motor cluster rocket which flies on standard 18mm motors. I built it last winter, and kept holding off launching it, because I was nervous about the wind. Finally, at a CMASS launch, I figured I had to do it. On four C6 motors, this rocket goes fast and high - nearly 1200 feet. I decided to give it a second flight at this launch, but wanted to be a bit more conservative with altitude. I installed four B6-4 motors, which, according to an OpenRocket simulation I ran, should have lifted the rocket to a much lower, but still respectable 460+ feet. Being a heavier model with lots of thrust, the Quadrunner requires a 3/16 inch launch rod - thicker and sturdier than the standard 1/8 inch rod for low power model rockets. The Range Safety Officer (RSO) assigned me to Pad 8, which had a 3/16 inch rod. I did not have much luck this day! The Quadrunner suffered some cosmetic damage, but nothing too severe. The forward end of the body tube looked like it had a hunk taken out of it, but it was not completely detached. I was able to pop it back into place, and it seems pretty strong. I could add some CA - cyanoacrylate or super glue - to the inside of it if I were worried about it coming loose. Since there wasn't enough time for the nose cone to eject, the rocket hit the ground nose first, and the impact caused a shock which created a fissure in the paint several inches down from the top. Irritating, since I'd gone through so much trouble with the painting of this rocket, but nothing major. It could have been much worse. Well, let's look at the motors. In the case of this rocket, two motors out of four did not fire. Because the two functioning motors were on one side of the rocket, the thrust was uneven, causing the rocket to fly in an arching trajectory. Why didn't these two motors fire? Was it an igniter failure, or was it similar to the Magnum Sport Loader, where the igniters pulled out before the launch button was pulled? To answer this question, I'll have to remove the retaining straws and have a closer look. From the photograph above, you can see that one igniter came loose during flight, while the other one held fast. The straw shows burn marks, so clearly the pyrogen-tipped igniter fired. Let's look at the motor. This motor has similar burn marks in the nozzle to the failed motor on the Sport Loader. The igniter must have pulled halfway out and fired in the nozzle, failing to ignite the motor itself. The onboard video I captured gives some clue as to why this might have happened. The swaying of the launch pad in the breeze, and the swaying and twisting of the rocket itself, added to the fact that, once again, I didn't think to clamp the launch controller leads to the blast deflector to reduce their pull on the igniters, all seems to have pulled at least one igniter loose. It appears the igniter did not fire, and there's no charring on either the motor nozzle or the retaining straw. Now, I did twist all igniter leads into a bundle, as I described above. The leads were properly wired in parallel. So, what happened? Well, this was my mistake, as I should have noticed the problem when I was twisting the wires together in the first place. 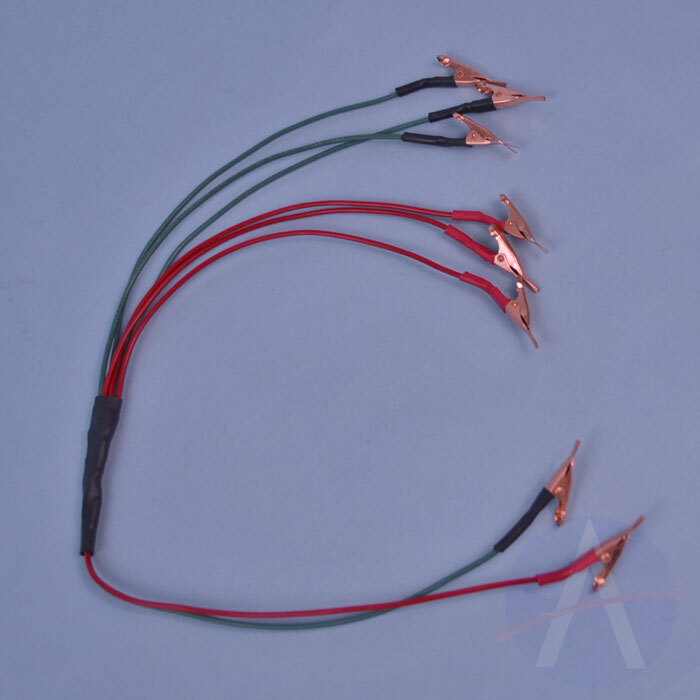 The bottom igniter has plenty of exposed lead wire for attachment to the launch controller leads - and for twisting into a bundle with other igniter leads. The top igniter, however, has one lead which has a lot less of the insulation stripped off. This means there's less bare wire to make contact with other igniter leads. That's a potential problem. Also, when I twisted the bundles of igniter leads together, there was one that was struggling a bit to reach the bundle. Twisting bundles of igniter leads in a cluster rocket can be somewhat fiddly work, and I think the real problem is that the lead for that one igniter simply wasn't reaching the bundle properly, to make good contact with the other igniter leads. In other words, for this one igniter, there was no continuity - no electricity flowed through the igniter at all. The solution: First of all, clamping the launch controller leads to the blast deflector would have help prevented one igniter from pulling out. That would have allowed three out of four motors to ignite - still not perfect, but the rocket may have gotten enough altitude for the parachute to deploy before the rocket hit the ground. Two B motors are simply not enough for a rocket of this size. Three might have allowed me to squeak by. For the other motor, one solution would have been to strip more insulation off the igniter lead, and to take more care to re-position the bundle of leads so that all wires made full contact with the others. Here's a situation where a clip whip might have been a good idea, since I wouldn't have had to make two bundles of four wires each. I also don't like how much that launch pad is swaying in the wind. In this case, I think it was the pad itself, not the launch rod, even though a 1/8 inch rod is not ideal for this rocket. I don't know why I had so much trouble getting the rocket on the first launch rod - I've launched this same rocket on that same rod before. I tried sanding the 3/16 inch rod, in case it was slightly corroded, but that didn't seem to be the problem. But I'd have liked a sturdier launch platform. My club sets up a ring of launch pads for low power rockets, and each pad is atop a single fence post driven into the ground. This is fine for most rockets, but in future, I might bring my own launch pad for this rocket. A tripod might be less susceptible to swaying in the wind. I'll also want to see if I can sand out any debris or paint from inside the launch lug. In truth, I wish I had put micro rail buttons on this rocket. Micro buttons are tiny versions of the larger buttons high power rocketeers use, and allows you to launch from a sturdy pad made of a MakerBeam rail. Because of its strong cross-section, a rail is much less likely to sway in the breeze. I discovered these buttons just after completing the Quadrunner. I could cut off the launch lugs and replace them with micro buttons, but that would mar the rocket. I think I'll try to see if I can make the lugs fit the rod before doing that. The 'Night, Ned rocket waits for nightfall. The last launch of the day would be a night launch. This would be my first time launching a rocket at night, and I was pretty excited about it. I spent about a week designing and building a simple rocket for this purpose. The 'Night, Ned (bonus points if you get the reference) is a simple, three-motor cluster rocket. It's not terribly pretty or interesting-looking, but it satisfied some basic night launch criteria. As a larger, BT-60 based rocket, flying on three A motors, it wouldn't go too high, so recovery wouldn't be too difficult. As a cluster rocket, there would be three times the flame coming out the back, making it a more spectacular launch to watch. And the nose cone, part of the new Estes BT-60 nose cone three-pack, had a hole in the base which was a perfect fit for the blinky LED light I'd bought from JonRocket.com expressly for night launches. can be taped into the base of the nose cone. It flashes brilliant red, white and blue. Our club requires that night launch vehicles have external illumination of some kind, so that the rocket can be seen during its whole flight up to recovery, so I was glad to discover that the blinky light fit the nose cone. I documented most of the build in the "Current Projects" photo album on the Rocket N00b Facebook page, so I won't go into that here. The rocket hopped a few inches up the launch rod, then settled back down onto the pad. Only one of the three A8-3 motors had ignited, and it had no hope of lifting the whole rocket. When I examined the rocket back home, I found more of the same problems described above: two motors failed to ignite. One igniter got pulled loose and fired in the nozzle, and the other igniter did not fire at all. but remained somewhat intact. The upper right igniter failed to fire. The solution: Same as above. Secure the launch controller leads and take better care when twisting igniter leads together. This is by no means a complete listing of all the things that may go awry during a rocket flight, but it's what I was able to document at my last launch. This post was pretty exhaustive about these four rockets, but frequently, you'll be able to simply look at the rocket and deduce what happened. Examine your evidence, draw your conclusions, and try to figure out how you might prevent a bad flight in the future. The more you launch, and the more you learn about rocketry, the better you will get at this, and the more likely you'll have more successes than failures.